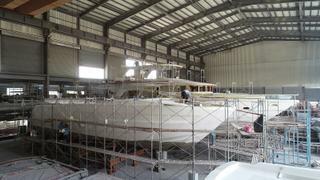 Taiwanese yard Johnson Yachts has begun construction on its first “entry level superyacht”, the 21.3 metre Johnson 70. Designed by Bill Dixon of Dixon Yacht Design, the customisable yacht is available with a skylounge or open fly bridge and in a three or four cabin layout. 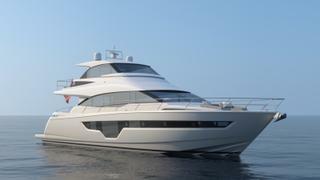 It comes after the yard revealed the first renderings and details about the design at the Fort Lauderdale International Boat Show last year. The first flybridge has begun construction and will feature interiors by Design Unlimited, which will include a mix of textures and materials for a stylish and comfortable environment. The galley sits forward on the main deck while an L-shaped sofa sits opposite accompanied by a large dining table and loose chairs for easy, large group dining. 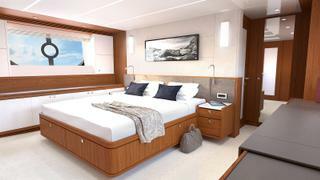 The main saloon social area will feature a built-in chaise longue and loveseat while wide sliding doors will provide access to the cockpit. There is also an option here to add a fishing cockpit, a feature which led the yard to previously describe the Johnson 70 as “truly a blank canvas”. Other features include davits for deploying the tender and an al fresco galley complete with a grilling station for outdoor entertaining. The yacht is available in either a three cabin or four cabin layout for a maximum of eight guests in four double ensuite cabins. The full beam master sits amidships and is equipped with a desk, dressing table and large walk-in wardrobe area. The yacht has a 5.6 metre beam and is equipped with a pair of CAT C18 1015HP engines for a max speed of 25 knots. Johnson Yachts general manager Peter Chang said, “With the design and engineering of the Johnson 70 – together with Design Unlimited and Bill Dixon - we have a yacht designed to be versatile. It came after the yard revealed new details and renderings of its new flagship, the Johnson 115 at the Fort Lauderdale International Boat Show in November. The yard’s first tri-deck yacht has also been designed by Bill Dixon and will accommodate either 10 or 12 guests across five or six staterooms.